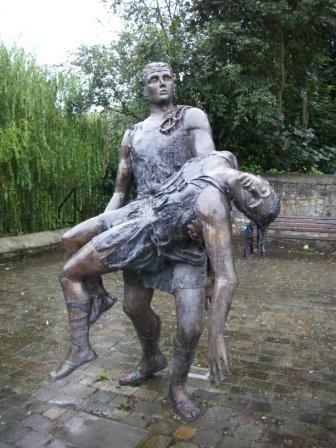 The Irish name of County Louth and Louth Village -- Lú -- comes from the god Lugh Lámhfhada (Lugh of the Long Hand) a/k/a Lugh Samildánach (Lugh of Many Talents), the father of Cúchulainn. 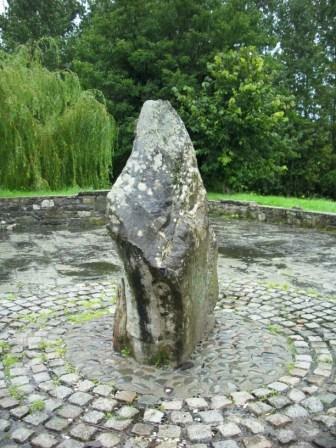 Louth Village -- Sráidbhaile Lú -- was a centre of the Lugh cult in Saint Patrick's time. Ardee (Áth Fhirdia -- The Ford of Ferdia), where Cúchulainn was forced into single combat with his best friend Ferdia and killed him. 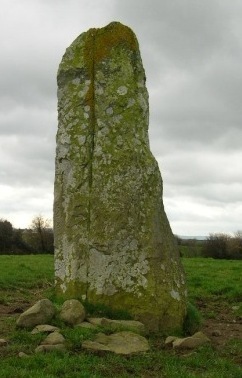 The standing stone commemorating Ferdia's death was erected by Maeve and Ailill at the ford a short walk west from the main street. According to local tradition, this is the pillar Cúchulainn tied himself to after he received his fatal wound, so he would die standing facing his enemies. The field where it is located is still called "The Field of Slaughter". 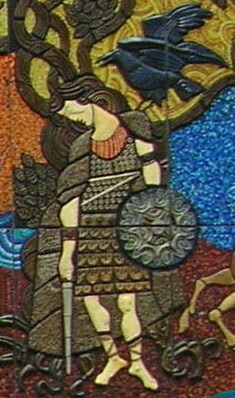 Detail from Desmond Kinney's mosaic mural Setanta Wall (1974) off Nassau Street, Dublin. The Fort of Dealga, a Fir Bolg king c. 2000 BC, from which the town of Dundalk gets its name. This was Cúchulainn's border fort to defend the main route to Emain Macha, capital of Ulster. A 12th-century Anglo-Norman motte was built on top of it, and the ruins of an 18th-century house can be seen on top of that. 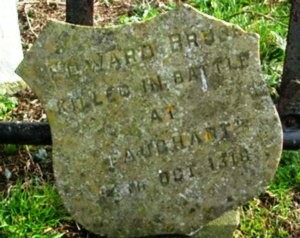 Saint Brigit's birthplace and holy well, site of one of Cúchulainn's battles, and the grave of Edward Bruce, brother of Scottish king Robert, who died in a battle here in October 1318 after being declared king of Ireland. This is a late neolithic (2500-2000 BC) portal tomb, one of the most picturesque in Ireland. The capstone weighs 40 tons. 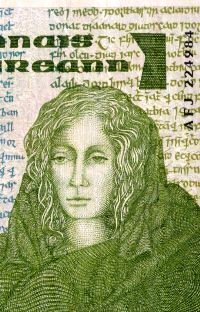 When Diarmuid eloped with Fionn's wife, Gráinne, Fionn chased them around Ireland for a year and a day. Angus Óg, Diarmuid's foster father, advised the couple never to sleep two nights in the same place. Each night, Diarmuid built a shelter for himself and Gráinne, and so there are (said to be) 366 dolmens in Ireland, called locally "Diarmuid and Gráinne's Bed". We visit the above sites and some -- as time allows -- of the following. An Iron Age defensive or anti-cattle raid earthwork in South Armagh, possibly part of the Black Pig's Dyke, an intermittent defensive earthwork along the ancient Ulster border. This is a gap in the Cooley Hills in the Carlingford Peninsula where Maeve's army camped while searching for the Brown Bull (optional hill walk). 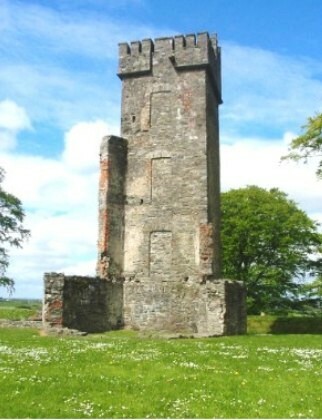 Cauthleen, the tall Spanish wife of Lorcan O'Hanlon, "died of disappointment" when she arrived in Ireland and saw the home with a spectacular view (but few amenities) promised by her husband. Táin Bó Cuailnge (The Cattle Raid of Cooley), the great epic of Ireland and the oldest epic in the vernacular in Europe, tells of Cúchulainn's single-handed defence of Ulster against the invasion of Queen Maeve (old spelling "Medb", pronounced "mave") of Connacht to steal the Brown Bull of Cooley. 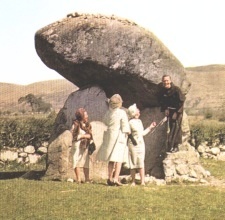 That's Maeve on the right, as she appeared on the old £1 note. The background is part of the manuscript of the Táin. You can see Maeve's name ("medb") at the top above her head. The old poets used to spend a week of evenings telling the epic. Cúchulainn and Christ were the heroes of Patrick Pearse, leader of the 1916 Easter Rising.